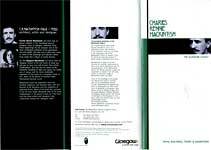 The Charles Rennie Mackintosh Society is an independent charity established in 1975 to promote and encourage awareness of the Mackintosh legacy. 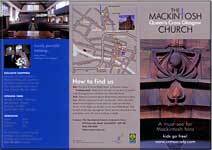 In 1999, the Society became owner and long-term custodian of the Mackintosh Church at Queens Cress. Membership of the Society provides a unique opportunity to share in the ownership of an original work by Mackintosh as well as other benefits . 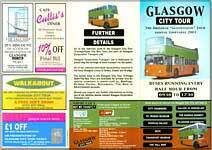 All of the vehicles used In the Glasgow City Tour (Vintage Open Top Bus Tour) are part of Glasgow Corporation Transport Ltd . Glasgow Corporation Transport Ltd is dedicated to preserving the heritage of local transport for the public. All of our vehicles have been decoratively restored in the local Glasgow Livery of Green, Cream and Orange. Mackintosh took his inspiration from our Scottish traditions and blended them with the flourish of Art Nouveau and the simplicity of Japanese forms. Much of his work has survived . 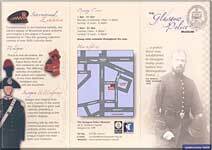 It can be seen today alongside that of his close collaborators in the group known as "The Four and the other artists and designers who collectively created the "Glasgow Style"...find out more with the help of this map. The House was completed in 1996 inspired by CRM's portfolio of drawings of 1901 which were submitted as a competition entry to a German design magazine . 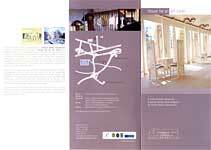 A permanent exhibition of decorative furnished rooms have been realised by contemporary artists and craftspeople . 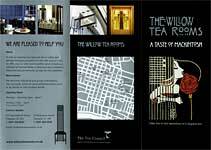 Step inside the world-famous Willow Tea Rooms, designed by Charles Rennie Mackintosh in 1903, for entrepreneur Miss Kate Cranston . The Willow name comes from Sauchiehall, the street where it is situated, which in Scottish Gaelic means alley of the willows. The Willow remains open today to welcome visitors keen to experience the splendour of a bygone era and take tea just as they did in the same rooms and interiors 100 years ago. 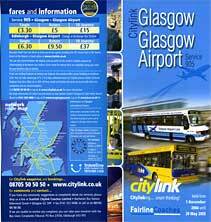 Buy your ticket from the driver or from any of our agents including the SPT Travel Desk or the Tourist Board at the Airport, or book online at www.citylink.co.uk . You can also travel between the Airport and any point on the Scottish Citylink network by interchanging at Buchanan Bus Station . 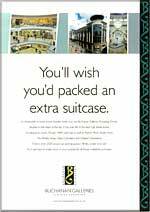 Great value for money fares are available saving you more for your business trip or holiday. The Glasgow Art Fair, Scotland's National Art Fair, celebrates its 1Oth year with an extended five days in the heart of the city, from 28th April - 2nd May. Bringing together over 60 selected galleries and arts organisations from across the UK and abroad and presenting work from over 1000 artists, the Glasgow Art Fair brings you an exciting and diverse range of modern and contemporary art works in all media . Colleges Cycle Route stretches from the University of Strathclyde in the City Centre to the Jordanhill Campus of the University of Strathclyde in the City's west end, a distance of approximately 7kms. The corridor serves approximately 45,000 students and 10,000 staff at the above colleges/ universities . 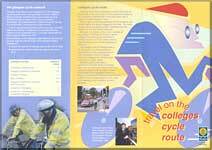 The route will also serve the general public, travelling from the west-end to the city centre by bicycle . 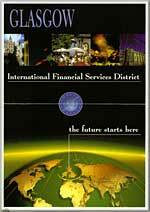 Launched on 13th August 2001, by Scotland's First Minister, the International Financial Services District (IFSD) represents a 300 million investment in a finance specific, pre-equipped business area, designed for fast track occupancy by indigenous and overseas firms. The aim is to build a robust infrastructure to support the financial sector's competitiveness in Europe and Worldwide. The Broomielaw Is an area of the City which has undergone major changes in its role and corresponding built environment. Glasgow Harbour is Glasgow's flagship waterfront development, transforming 120 acres of former dockland into a high quality mixed development with offices, homes, shops and leisure facilities . Where is it? 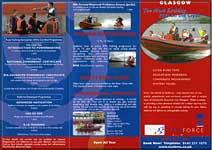 Glasgow Harbour is situated on the north bank of the River Clyde, running between the Clyde Tunnel and the SECC. 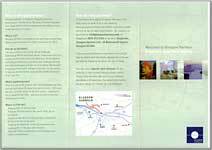 On 30 June 2003, Kelvingrove Art Gallery and Museum closed its doors for a three-year, �25.5 million refurbishment . 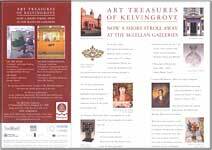 During the closure the highlights of the fine and decorative arts collections are being brought to The McLellan Galleries in the city centre . Art Treasures of Kelvingrove will showcase some of the highlights from Kelvingrove's collection as well as those favourites chosen by the public and museum staff. Complementary to the historical exhibits, this vibrant display of Worldwide police uniforms and insignia is the largest in Europe. Established in 1966 this growing collection consists of over 5000 colourful items. Practical and decorative, the caps and helmets of Police forces from all five continents are on display . The differing varieties of tradition and culture are captured in the most distinctive headgear you will see anywhere. Enter the world of Seaforce - step aboard one of our quality powerboats and surround yourself with a unique view of Scotland's favourite city. Glasgow. When it comes to providing a new adventure whether for a visitor day trip, a fun staff day out, or providing an unusual setting for your clients, Seaforce will deliver an unforgettable journey. 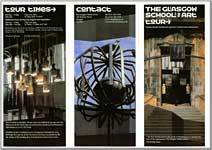 The history of the Glasgow School of Art is inextricably linked to Charles Rennie Mackintosh. A graduate of the School, Mackintosh's 1896 design for a new School of Art building heralded the birth of a new style in 20th century European architecture and remains at the centre of the campus. But Mackintosh was more than just an architect. He was also an outstanding international artist and designer. Charles Rennie Mackintosh designed The Glasgow School of Art in 1896. Today, over one hundred years later, The Glasgow School of Art is still a hardworking art school attracting talented students from all over the world . 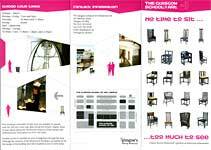 The Mackintosh Building continues to be admired and respected and has taken its place as one of the most influential and significant structures of the twentieth century. Titanium-clad like the IMAX the Science Mall is the hands-on building presenting over 300 interactive exhibits on science and technology and their relationship to everyday life. Featuring subject areas from the local to the international and out of this world into space, the Mall takes an interactive approach and fun is the key throughout a brilliant day out for ages 3-103. 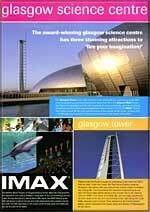 Also includes the IMAX cinema and The Glasgow Tower (the tallest structure in Scotland). 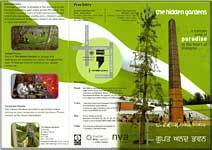 The Hidden Gardens is a sanctuary garden, which celebrates the diversity of nature and humanity. The design and planting within the space reflects this with a mixture of native and exotic species, many of which have been chosen because of their special significance to different cultures and belief systems. The Hidden Gardens have been designed to accommodate activities ranging from a large celebration to solitary contemplation. Shops in the Merchant City have a vital role to play in ensuring that the area maintains a vibrant and interesting range of economic activity, whether as shop windows, cafe and restaurant frontages or other public services such as banks . 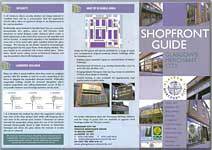 Within the Merchant City there are numerous examples of excellent original, traditional and modern shop fronts . 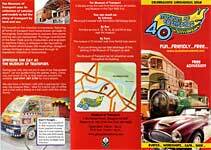 The Museum of Transport uses its collection of vehicles and models to tell the story of transport by land and sea. The breadth of the collection is impressive, featuring all forms of transport from horse-drawn carriages to fire engines, from motorcycles to caravans . Even prams and toy cars are represented. The huge contribution of the River Clyde and its shipbuilders and engineers to maritime history is reflected in the fascinating Clyde Room which houses 250 model ships. 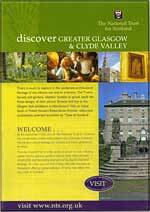 Glasgow's railway heritage is also celebrated through its impressive collection of locomotives. This first-floor apartment was the home of shorthand typist Miss Agnes Toward, who lived here for over 5o years. Little has changed since the turn of the 2oth century, and you can see many of the original features such as the bed recesses, the kitchen range, coal bunker and bathroom . Step into the magnificent mahogany and marble hallway at Pollok House and it's hard to believe you're only a few miles from Glasgow's vibrant city centre . The ancestral home of the Maxwell family who lived on the site for over six centuries, the present house was begun in the mid-18th century and extended in the Victorian period . The interiors at Pollok House are fabulous and visitors will be delighted by the period furnishings, silverware and ceramics on display. Commissioned in 1902 by the Glasgow publisher Walter Blackie, the house still makes a striking statement today. Blackie wanted an individual feel to his home and he asked Mackintosh to design not only the house and gardens, but much of the furniture and interiors too. Mackintosh's wife, Margaret Macdonald, contributed fabric designs and a unique panel over the fireplace in the drawing room . The result is a daring design with an air of restrained elegance, which still appeals to modern-day tastes . In January 1905 readers of the Glasgow Evening News first met "Para Handy, Master Mariner." Since then Neil Munro's immortal skipper and the Vital Spark - "the smertest boat in the coastin' tred" - have won a very special place in the hearts of those who love the West of Scotland . 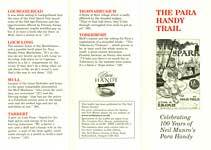 Munro's stories have been continuously in print for the last 100 years and Para and the Vital Spark sail into the 21st Century as fresh and as funny as when they first appeared in the News . Hampden Park, Glasgow's world record breaking stadium, has always been at the centre of games heritage . Now you can experience the magical history of this hallowed Stadium in the unique surroundings of the Scottish Football Museum. 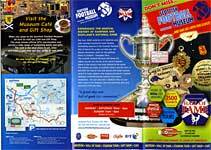 When you come to the Scottish Football Museum be sure to visit our Cafe and Gift Shop. The shop stocks official SFA merchandise and carries a wide range of footballing books and gifts. .
Scotland's influence on the maritime history of the world from the eighteenth century to the modern day has been enormous and out of all proportion to the size of the Country. 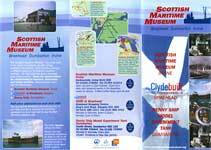 The three sites operated by the Scottish Maritime Museum contain the exhibitions and collections that tell the story of that great maritime tradition. On two of the sites the buildings themselves are important parts of that story. The sites are complemented by the collection of vessels that represent 150 years of the working vessels of Scotland. There is much to explore in the exuberant architectural heritage of this vibrant city and its environs . The Trust's houses and gardens, whether humble or grand, typify the finest designs of their period . 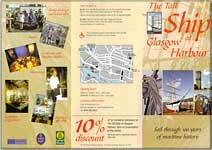 Browse and buy at the Glasgow Style exhibition in Hutchesons' Hall ; or enjoy lunch at Pollok House's Edwardian Kitchen restaurant, consistently awarded accolades by 'Taste of Scotland' . Hundreds of tiny carved figures and pieces of old scrap perform an incredible Heath-Robinson-meets- Hieronymous-Bosch choreography to haunting music and synchronised lighting, telling the funny and tragic stories of the human spirit struggling against the relentless circles of life and death. 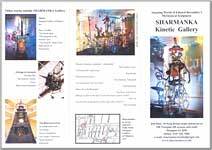 SHARMANKA (Russian for barrel-organ or hurdy-gurdy) was created by sculptor Eduard Bcrsudsky and director Tatyana Jakovskaya in St Petersburg (Russia) in 1990 . Take off with the family for the day with a Daytripper ticket . With unlimited travel for one day by rail, Subway, most buses and some ferries throughout Strathclyde, the savings are enormous! 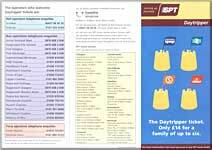 Daytripper tickets are valid after 9.00am Monday to Friday and all day at weekends and Glasgow public holidays . Tickets can be bought from any staffed rail station or SPT travel centre . Why were sailing ships still being built 80 years into the age of steam? Learn about the hard economics of world trade at the end of the nineteenth century. What was life at sea like for the apprentices and crew? Share the experience of working aloft in all weathers, bracing yards and living in the cram, deck house. Restored to her former glory, the Glenlee is one of only five remaining Clydebuilt sailing ships still afloat in the world. A visit takes you back in time to experience what life was like on the high seas. Visit the galley, take the wheel, explore the cargo hold . Where did the Glenlee sail? What did she carry? What did the crew eat? What was it like to command a ship in mid ocean? 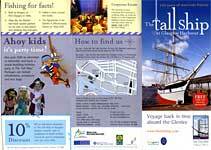 Discover what life was really like aboard a tall ship .